Have you ever seen a song get dressed? Every single song has a different genesis and development. It’s tricky to do, but I’m going to attempt to evoke the creation and metamorphosis of one song in particular. This tune’s called ‘Old Fashioned’, a collaboration with my main songwriting partner Samuel Vincent. A modest tune, it doesn’t exist as a studio recording yet. It is old fashioned in style, and that’s deliberate. There are other songs that invoke this very phrase, but I’m not considering them during the writing process I describe here. You can’t get too caught up in ‘being original’. You can’t be blind to the influence of others, but you can’t allow yourself to be blinded by it either. In fact the song was called ‘Wireless’ for the first part of its development. A couple of friends (ironically) used the expression ‘hold hands and listen to the wireless’ to refer to how they might spend an evening at home. This got me thinking about the image of an older couple doing exactly this. 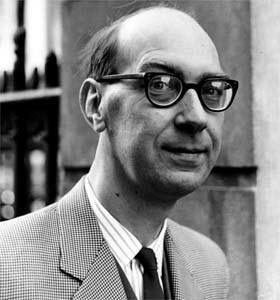 I was also going through a big Philip Larkin stage. His writing’s often gorgeous, but the world-view is pretty wearing. His poem Broadcast depicts someone at home listening to a live (classical) concert on the radio, in the knowledge that his loved one is present at the actual event. Your hands, tiny in all that air, applauding. (You can find the full text of Broadcast here, but you’ll have to scroll down) So a simple picture of a couple listening to their favourite song on the radio sprang to mind, and I wrote around that. They’re not listening to hands applaud, they’re holding each other’s hands. The words have a rhythm and shape on the page, and a rhyme scheme emerges, rather than being imposed. I send this lyric (maybe half a dozen stanzas) to Sam, who picks it from the bunch I sent him, and puts a tune to it. An mp3 arrives via email. Joy! It’s a gentle, swaying tune, with a classic feel. Sam’s playing it on the guitar into his iphone. Were the lyrics run out, or don’t fit, he dee-dee-do’s or sings “another line here”. I learn how to play it, getting inside the music, record my own demo and send it back. The music tells me the lyrics need work. They sound twee: not bad, but a bit try-hard and tied down, rather than liberated by the image they evoke. There’s stuff in here about ‘dents in a settee’ that well, isn’t sitting. This audio compiles fragments of three demos to give you as sense of the working versions of this song as it developed. It’s a bit like eavesdropping: normally, nobody hears this stuff except Sam and me. We play through it in rehearsal. I’m overjoyed, I think it’s tops. Sam wants time, though, to refine the song form, to experiment with a classic, Ink-Spots feel while retaining a sense of musical originality. We play through the song in rehearsal, on guitar and double bass, with me faking the vocals. It’s fun to play, it has its own life, but needs more work. “I’m not satisfied” says Sam on the end of one of our shared live demos. I redraft the lyrics and Sam has another go at the music. Next rehearsal we we play through it together again. I record this. Just a mic sitting on a table. I create another “franken-demo” at home, adding in a gratuitous vibraphone part over the rehearsal audio, and I crash another vocal on top of the original one with some new lyrics that come to me while I’m making the music. This is closer to it, less particular, more universal. It’s less of a pretty picture and more of a doorway. Some time during this process, Sam’s supersonic whistle steps in and the song has another hook. I glue on a key-changed, and static-treated version of the ABC news theme, which isn’t really necessary, but feels right at the time. With this the song is done. Time to step away from the canvas, we joke. It feels right. The lyrics and music combine to make something else, a third thing. I listen to the tune in my earphones while walking to work and can’t think of any more ways it can be improved. I like it. The audio’s rough, but it captures the warmth of the creative connection and the room where we made it. I’m proud of this song, and put it in the growing playlist of others we’re creating. I revive some of the music we’ve discarded in this two month process to create another composition called ‘Teatime’ which we use in Bear with Me, The show we’re working on at the time. Sam presents Old Fashioned to his bands: vintage swing ensemble Laique and uke & harmony group The Pockets. I’m not sure about how this process works: not being a member of either band, I keep my nose out of it. Happily, both ensembles decide they like it, and play it live, each interpreting it differently in their arrangements. Susan suggests the song is a companion piece (in subject matter, if not style) to another I wrote 17 years earlier called One Extra. I realise she’s right. Whatever I was subconsciously channeling while writing it has influenced the piece as well. Like other songs Sam and I have created, and like any ‘good’ song, it possesses the capacity to surprise and reveal new things, even after it’s ‘finished’. Hearing a song you’ve made played live for the first time only happens once, and now it’s happening more often I have learned to really savour it when it happens. It’s a privilege to be both inside and outside a shared musical moment, while the song does its thing. Here’s an early live version by The Pockets. It’s now appeared on Tyrone and Lesley’s album Gentlemen Songsters. Here’s a version by Laique from their album The Last Bend.